Actress Oviya is at present enjoying popularity unlike any other star in recent times in the Tamil film industry after her stint last year in the popular Tamil reality TV show, Bigg Boss. Post the success of her participation in Bigg Boss Tamil, Oviya’s career saw an instant surge in terms of endorsements as well as the number of roles among which her ongoing film is Kalavaani 2 also titled K2. 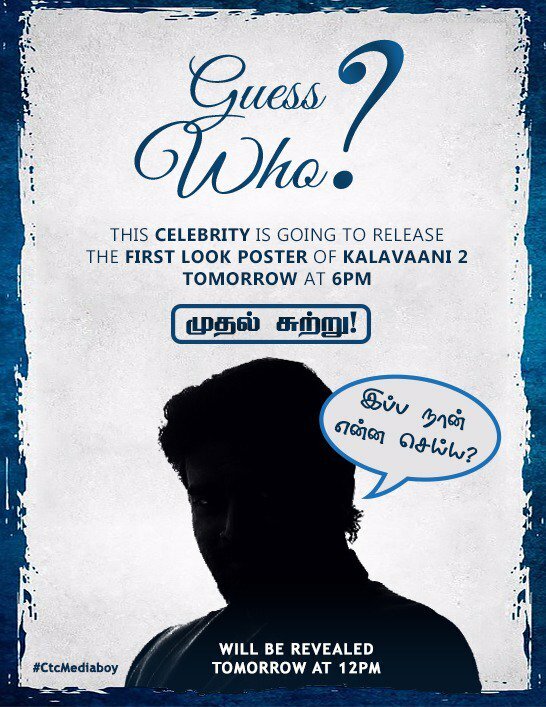 Being directed by Sarkunam with actor Vemal reprising his role from the hit 2010 film, Kalavani, the upcoming sequel will have its first look launched tomorrow (June 30) at 6PM with a challenge to fans to guess the celebrity who will launch the Kalavaani 2 first look. Based on the image the makers have shared, we are guessing the celebrity in discussion here is none other than actor Madhavan. >>Kanchana 3 New Song Promo Is Out! >>KANCHANA 3 New Terrific Promo Is Here! >>Kanchana 3: Important Deal Locked! >>18+ - New Romantic Scene from Oviya's adult film! >>Oviya's Adult Video From 90ML Is Out! >> 90 ML: Oviya to get Arrested for Acting in 90 ML?